← Earth Changes Media – for the latest info on our changing earth. 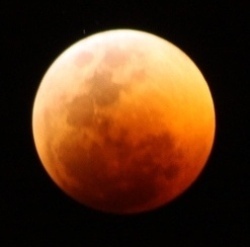 Total Lunar Eclipse – Earthquakes and Volcanoes That Follow. Historical dates of full lunar eclipse from 2001 to 2011. And here is what happened: Events which occurred within two weeks prior and/or two weeks after the last six full lunar eclipse. January 2001 – (India) A magnitude 7.6 earthquake shook the Indian Province of Gujarat. It was one of the two most deadly earthquakes to strike India in its recorded history. The death toll was 19,727, number of injured at 166,000, over 600,000 people were left homeless, with 348,000 houses destroyed and an additional 844,000 damaged. May 2003 – (Turkey) At least 176 people have died and 521 people were injured after a magnitude 6.4 earthquake that shook the eastern Turkey’s Bingöl province. Several public buildings collapsed in the centre of Bingöl city and its vicinity. The last official report concerning the consequences of the earthquake in the city indicates about 570 buildings were collapsed and about 6000 others were damaged. November 17th 2003 – (Alaska) One of the largest earthquakes in US history measuring 7.8 magnitude at Rat Island, Alaska. October 2004 – (Japan) A series of powerful earthquakes the strongest with a magnitude of 6.7 jolted northern Japan, killing at least 30 people and injuring more than 2000 people largely as the result of building collapse. March 6th 2007 – (Sumatra) Two quakes hit Sumatra measuring 6.4 and 6.3. Over 60 fatalities and 460 serious injuries have been reported, spread across many towns and regencies in West Sumatra. Over 43,000 houses were damaged, with over 12,000 of those severely damaged. August 15th 2007 – (Peru) Earthquake measuring 7.4 magnitude killed more than 600 people and thousands more were injured. February 21st 2008 – (Indonesia) A powerful 7.4 earthquake in Indonesia killed three people and injured 25 today, but did not trigger a tsunami. December 25th 2010 (Vanuatu Islands) A 7.6-magnitude earthquake struck in the Pacific Ocean’s Vanuatu Islands region early Sunday, prompting a tsunami warning for the area, according to the U.S. Geological Survey. January 1st 2011 (Argentina) A magnitude-7.0 earthquake struck a rural area of northern Argentina Saturday morning, but its epicenter was so deep that it gave only a light shake to towns nearby. It was not immediately clear if there were any injuries or damage, but the earthquake was hardly felt in Santiago del Estero, the provincial capital, where Emilio Abdala, a receptionist at the 14-story Hotel Casino Carlos V, told The Associated Press that nobody felt a thing. June 13th 2011 (Christchurch, New Zealand) A series of powerful tremors rattled the quake-prone New Zealand city of Christchurch on Monday, destroying buildings and sending boulders tumbling down hillsides nearly four months after a quake killed 181 people. This entry was posted in 2012, ancient text, ancient_text, asteroids, astrology, astronomy, climatechange, comets, cycle 24, earth change, earth changes, earth’s core, earthchange, earthchanges, earthchangesmedia, earthquake, earthquakes, earth_changes, extreme weather, flood, floods, galactic center, galaxy, global warming, hopi prophecy, hopi_prophecy, hurricanes, lunar-eclipse, lunar_eclipse, mayan, mayan prophecy, mayan_prophecy, mitch battros, mitch_battros, pole shift, science, solar eclipse, solar storm, solar_eclipse, solar_flares, solar_system, space, space weather, sun-earth, sun-earth-connection, sunspots, sun_earth_connection, tsunami, Uncategorized, universe, volcanoes, weather, yellowstone volcano and tagged 2012, ancient_text, ancient_wisdom, asteroids, astrology, astronomy, cascadia_subduction_zone, charged_particles, climatechange, climate_change, comet, coronal_mass_ejection, cycle_24, earthchanges, earthchangesmedia, earthchangestv, earthquakes, earth_changes, earth_changes_tv, el_nino, floods, galactic_center, galaxy, global_warming, hopi_prophecy, hurricanes, la_nina, mayan_prophecy, mitch_battros, pole_shift, snow_storm, solar_cycle, solar_storm, space, space_weather, sunspots, sunspot_count, supernova, tornado, tsunami, volcano, yellowstone_volcano. Bookmark the permalink.